We Celebrate the Terrific Twos! Toddlers discover something new each day! Two year olds are becoming more independent every day. They like to climb, run, play, and explore. 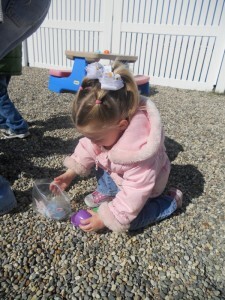 At Brandi’s Place Early Learning & Childcare Center, we understand these needs and nurture your child. We provide plenty of opportunities for outdoor and indoor play, as well as structured learning activities. We provide a safe environment for your child, providing clean toys in good condition as well as safe rooms for them to run and explore in. Our two year old teachers have much experience working with this age group, and are fully prepared to provide the type of educational and nurturing environment children of this age require. In our toddler program we introduce a more structured curriculum. We perform a variety of individual and group activities designed to allow your child to reach important milestones such as coloring, running, kicking a ball, and learning more words and sentences. We focus on intellectual, physical, emotional and social development. Brandi’s Place Early Learning & Childcare Center curriculum for this age group will encompass many factors. Children in this classroom will continue to learn sign language. They will also begin to learn Spanish such as numbers, colors, months, and days of the week. They will also learn to follow directions and a myriad of other skills and information. 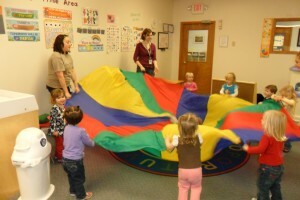 Your two year old will enjoy plenty of fun activities at Brandi’s Place! To help your child learn and reach milestones we work toward several activities each day, including puzzles, lacing, art, music and movement, imitating and pretending, and circle time. During circle time we work on the alphabet, counting, shapes, colors, weather, calendars, sign language, songs, and much more. To keep parents informed of their child’s activities, a daily curriculum is posted on the wall next to the sign in sheet. This allows parents to be involved in their child’s education, and reinforce learning at home. We will be happy to discuss your child’s progress and daily activities at any time or when you pick them up each day. Independence is a key theme in this classroom. Children are encouraged to try to do things on their own. We will, of course, help them when they need it, but in such a way that they learn something from the experience. Children are taught how to put on their coat and shoes on their own. We also work with potty training in this classroom. We encourage parents to share with us what they are doing at home for potty training so that we can do the same things at our daycare. It is important for a child to have consistency during this time.